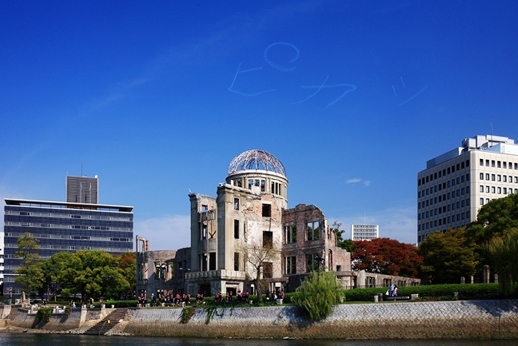 ‘Subversive’ art collective Chim↑Pom made headlines nationwide last year due to a certain sky-drawing in Hiroshima. What was all the fuss about? I don’t know what to make of Chim↑Pom. I tried to like them. I really did. I did my research, read the reviews. “New fresh subversive blood explodes onto the Japanese art scene! Politically aware tricksters turning the structure and rules inside out!” yelped excited sycophants. There seems to be no common theme across their exhibitions, such as the one where Ellie, their gyaru pin-up girl, threw up purple vomit, or where she rowed a dinghy across a rubbish-strewn floor, or where they filmed a Princess Diana-like video with Cambodian children…I couldn’t make up my mind what they were trying to achieve, nor what kind of group they were. Were they artful tricksters, intelligent commentators, fame-hungry kids attempting to be art star celebrities while ironically trying to subvert it? Or just reveling in how much attention people will pay to a false rebellion in a country where even eating on the train is an act of social disobedience? So I arrived at NADiff with mixed feelings of excitement and apprehension, hoping that the reality would justify the hype. The actual ‘exhibition’ is very small, consisting only of two pieces, none of them accompanied by a written explanation, as if the media flurry that preceded them was notorious enough. Actually, the group has published a book to coincide with the exhibition, but I object in principle to the idea that you have to spend 2500 yen and a week reading a book to understand an art work; it should speak for itself. But for those who didn’t catch the media buzz last year, in brief: in October, the six members of Chim↑Pom staged a stunt in Hiroshima, spelling out ‘pika!’ (translated as bang! and the word used in manga for the atom bomb) in smoke in the sky. A minor scandal ensued, involving both the public and various institutions, and a taken aback Chim↑Pom were suddenly forced to hold a press conference to apologize. In atonement for their act, they made the traditional symbol of hope or wishing; a thousand origami cranes. A building to house them was also designed, along with a book comprising interviews with around 30 Hiroshima survivors, inhabitants and commentators, and explanations from the artists themselves. Although the original exhibition in Hiroshima was cancelled, they held a recent three-day exhibition in Harajuku, and now have a week at NADiff to explain themselves. Downstairs in the basement, a looped tape records the ‘pika’ being slowly etched into the sky. As in the case of all performance art, watching the video after the event is a some-what flat and dull experience. You miss out on half the point: the audience. Through foreign eyes, the katakana ‘pika!’ seemed oddly innocuous, cute. I wanted to see the agape mouths of the Hiroshima public, pensioners hopping mad in the streets. Perhaps the collective want you to view it as if you were there, but in a basement in Ebisu the emotional context is hard to grasp. 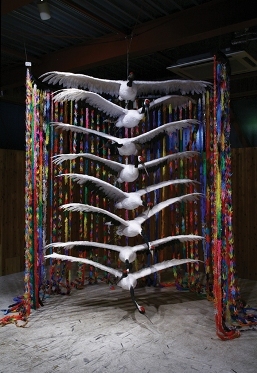 Upstairs hangs the far more arresting ring of vividly coloured cranes, surrounding several life-size plastic birds. Below are eight wooden plaques with messages inscribed into them, including: ‘Hope’, ‘I want war to end, ‘Love and happiness for everyone, ‘and ‘Peace in the world’. Fortunately, they sound less cheesy in Japanese than English. Opposite this is the small architectural model of their proposed peace building, with the origami sculpture hanging in the middle. What struck me was the incongruity between the apparent flippancy with which they executed the initial act, and their subsequent painstaking efforts to atone for their sins. What did they mean to express or achieve by it in the first place? The group’s own explanations are not particularly clear; Ushiro, one of the members, was quoted around the time of the event as saying that they aimed to increase awareness of the bombing amongst the younger generation. If they really intended to break the last taboo in Japanese society, and the reverent hush that surrounds it, they might have crafted a more elaborate explanation of their motive. But they didn’t. Instead, they caved to social expectations – or, in their own words, “exercised self-restraint” – and hung their heads, muttering their “sorry”s in front of the flashbulbs in an eerie echo of shamed politicians. In doing so, they implied they were ignorant of the significance of their actions, emptying them of political intent and debasing them as simply an irreverent joke or aesthetic experiment. Had they done it in Europe or America, a refusal to apologize would probably have earned them respect for artistic integrity. But this is Japan, and such insolence might have instead cost them their audience. So they back-tracked from their position as cutting-edge rule-breakers, into the position of the ignorant disciple (kohai), begging various elders (senpai) to educate them and show them the error of their ways. Yet perhaps I am being too naive to take their statements at face value, and should put more faith in their admirers, who claim media savviness as one of their strengths. It is possible that they anticipated the furore all along, praying for the performance to mushroom – like the original bomb – into a social debate about propriety, respect and the modern relevance of the tragedy. Since most of their art, political or otherwise, is based on an irreverent humor, perhaps they were simply replicating the common theme in Japanese comedy – playing the fool to invite criticism and reflection. And although they claim their idea originated as simply an aesthetic one, they may well have been aware that it was an opportunity to gain the column inches and notoriety they seemingly crave. By the hype they generated, and the overwhelming turn-out at the artist’s talk, it seems the book will sell – and then they will have the last laugh, all the way to the bank. Chim↑Pom are also participating in the “Winter Garden” exhibition at the Hara Museum of Contemporary Art. To read more about Chim↑Pom, TABlog reviewed their “Oh My God” show in 2007.